If you enjoy the television quiz show the Chase then head straight over to Gala Casino where the chase is on to win great bonuses. After opting in you will start the chase on Step 4 and the chaser begins on Step 1. Every £50 you bet on the casino’s The Chase slot per day will move you one step along while the Chaser will move one step along every day regardless of what happens. 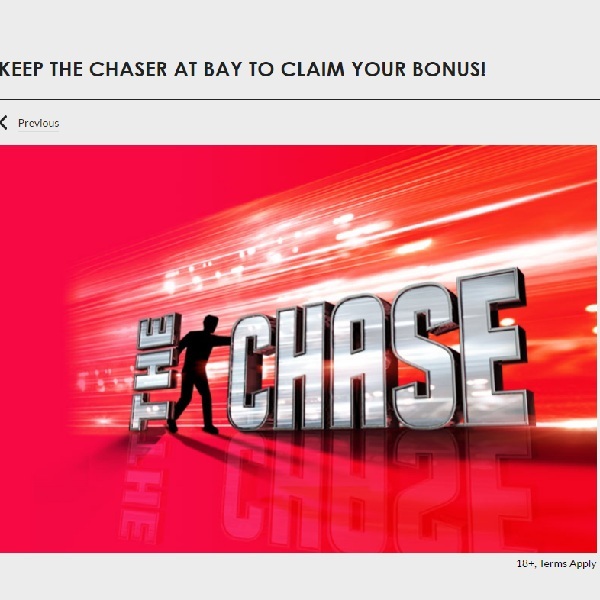 If you can reach Step 7 before the chaser catches you then you will receive an instant £20 bonus. This is a great chance to enjoy a fantastic slot and try to win a bonus at the same time. Head over to Gala Casino today and set the reels spinning to make sure you reach the end before being caught by the Chaser.